After all paranormal books, I read a historical romance book, the story situated in post WW2 world. And I enjoyed it a lot. Where Shadows Linger is actually book nr.2 in a series, but I can be easily read as stand-alone story. It didn’t bother me one bit that I hadn’t read the first book. The book tells a part of the story of Eva and Zoe. They’re in love, but are forced to keep it a secret as in late 1940’s there was no such thing as being openly something other than heterosexual. But this is just the context, the main story is about people surviving the aftermath of WW2. Both Eva, who’s German, and Zoe, who’s Greek, have personally faced the horrors of Nazis. Building new life in Australia isn’t easy and weight of the ugly past is heavy on their shoulders. Zoe is the one who cooks in the book, Eva apparently lacks kitchen skills. So naturally the story is full of wonderful Greek meals. Galaktoboureko is mentioned in page 258 of Kindle edition. But as it is only one sentence, I’ve chosen another quote which represents the book moore. Zoe made her feel alive again, gave her hope, and made her laugh. She opened up a part of Eva that lay dormant, a part Eva had thought long dead. Eva began to dream of a world where she wasn’t going to feel the wrath of her father, her uncle, or their machinations. The world held new possibilities and maybe, just maybe, there would be a little bit of happiness for her. 1. The filling. Mix the semolina flour, corn starch, salt and sugar together in a bowl. Then take a deep pan and pour the milk into it. Bring the milk to a boil and gradually add the flour mixture, whisking constantly. Bring the mixture to a boil again until it thickens, then take off the heat and set aside. Cover the pan with a lid. 2. Separate the yolks and whites. Put the whites into a large bowl and beat them with 0,5 dl sugar into meringue. Then put the yolks into another bowl and beat them with 0,5 dl sugar and vanilla powder into thick, fluffy, light coloured consistency. I recommend using an electric mixer. 3. Fold the meringue in small batches into the yolk mixture. Then fold the egg mixture into the hot semolina filling. 4. The syrup. To top the dish, make your own syrup. Here’s the recipe, just instead of vanilla use one cinnamon stick and one whole dried star anice. Let it cool while making the rest of the dish. 5. The filo dough. In a large bowl, mix the wheat flour with salt, water and oil by hand. When the batter is somewhat mixed, pour it onto table and start kneading. To prevent it from sticking, use mixture of corn starch and wheat flour on the surface. Knead the dough for ten minutes to gain adequate viscosity. 6. Divide the dough into 12 equal sized pieces and place the under a damp cloth to prevent them from drying. Pre-heat the oven to 180’C. 7. Take a deep non-stick oven pan (mine was approx. 25 x 35 x 6 cm), melt the butter and grease it. 8. 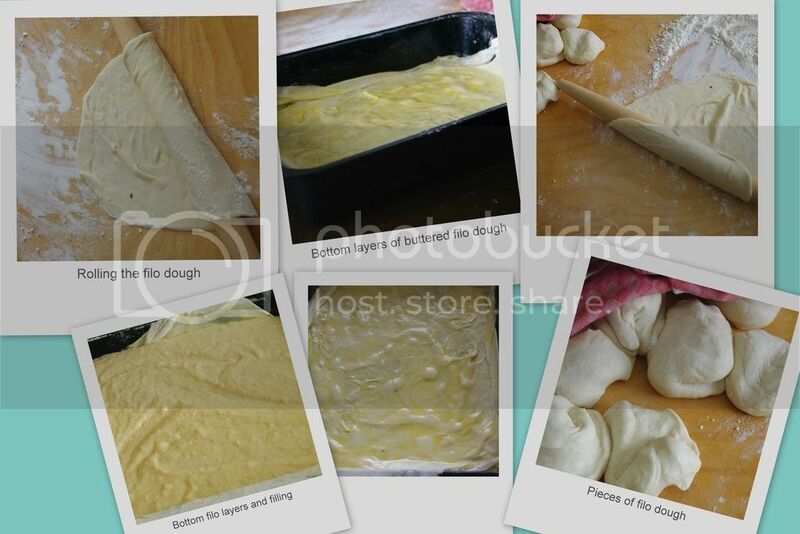 Take a piece of dough, roll it into a ball and the flatten it. Use flour on the surface to help the rolling. Roll the dough into thin sheet (when you have rolled it a little, roll it over the pin and while rolling it, gently move your hands outward on the pin stretching the sheet). Remember to flip it over occasionally so that all sides are equally thin. Don’t be afraid of tearing, there will be enough layers on the dish, so it doesn’t matter. 9. When the sheet is the size of the oven pan, lay it on the bottom and brush it with melted butter. Repeat this until you have seven layers of filo sheets (don’t forget to butter each layer). 10. Pour the semolina filling into the pan and smooth it. 11. Repeat the part 7. until you have covered the filling with five layers of filo sheets. Remember to brush each layer with butter, the top one too. 12. Bake the galaktoboureko for about 45-60 minutes until golden brown. 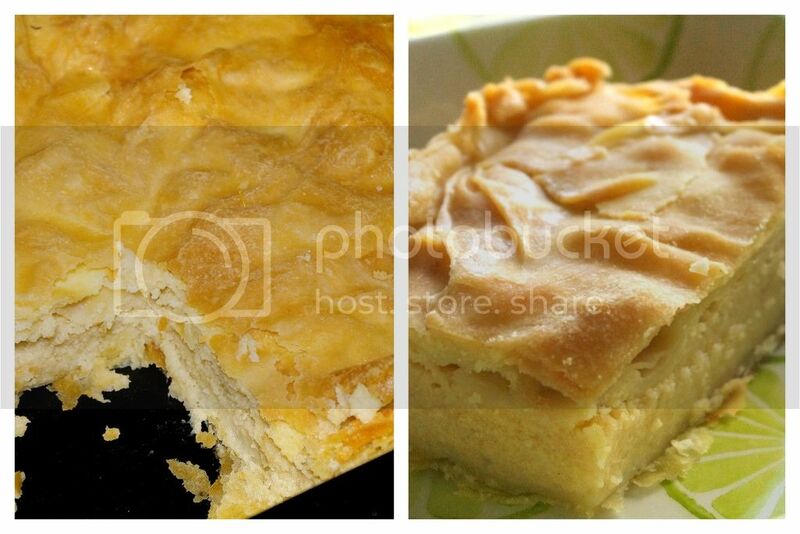 When the galaktoboureko is baked, top the hot dish generously with syrup, particulary the edges. I used the whole amount of the syrup that is made with my recipe. 13. Cool completely before cutting and serving. Tastes the best after a night in fridge. This is the story of Eva and Zoe, situated in Australia in aftermath of WW2. Eva is a German, victim of terrible diversion therapy performed by his stepfather’s brother. And the reason for this therapy was her sexual orientation, because nothing could disgust and make her Nazi stepfather more angry than Eva being a lesbian. And rather than letting her go or disowning her, he keeps punishing her and making her life hell, especially after her mother dies. Zoe is a Greek, first hired to help Eva when her stepfather as a high rank army officer was assigned to Greece. Eva’s stepfather was responsible for killing Zoe’s parents and to revenge, Zoe was determined to kill Eva. But she didn’t. Instead she fell in love with her. This book is a beautiful love story and authentic portrait of F/F relationship in late 1940’s. Mary D. Brooks has written strong characters, independent females that are determined to be together and overcome all the obstacles that life throws at them. And despite the horrors of their past, they are very hopeful of the future and what may come. Beautiful story and characters in every sense. Where Shadows Linger can be read as stand-alone. So no worries if you haven’t read the first one in the series.